So far at Comic-Con I have seen two pilots, which bear several similarities. The Secret Circle and Locke and Key each begin with a parent gruesomely murdered by a mysterious villain, and children going to live with relatives in old family homes harboring secrets. Both involve elements of the supernatural. That’s about where the similarities end. The Secret Circle has lots of pretty girls and high school rivalries and a budding grandmother-granddaughter bonding story. 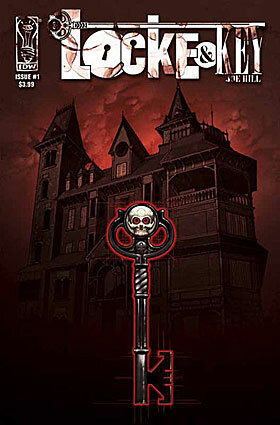 Locke and Key is terrifying, set in a remote manor, and raises more questions than it answers. Which one do you think got picked up for the fall schedule? Yep… If you didn’t see Locke and Key at one of its two Comic-Con screenings today, you probably never will. And it’s a damn shame, because it’s awesome. Fox (who passed on it) probably wasn’t the right network. It looks like something one would see on AMC or even HBO. One of the concerns from fans of the comics was that the emphasis of the show would be too much on the mother character and less on the children. That fear turned out to be unfounded, and the audience in the screening room seemed delighted by the pilot. I’ll write descriptions of both of these later. Too busy geeking out! This entry was posted in 2010s, Dramas and tagged comic-con, comics, locke & key, The Secret Circle by meekthegeek. Bookmark the permalink.